Beautiful, smart and educated. A ruler of two countries well versed in the matters of the state. Patron of arts and church. An army leader. Crusader. A lover. Spouse. Friend. Enemy. Schemer. She was an epitome of a badass before the word, the notion existed. In the 12th century Europe when women mostly dwelled in the shadows, nameless, faceless, wordless, she was admired, loved, loathed and hated. Everybody knew her name, her voice and her face (even if today we have no idea how she looked like), what she wore, who she saw, what she liked and disliked. 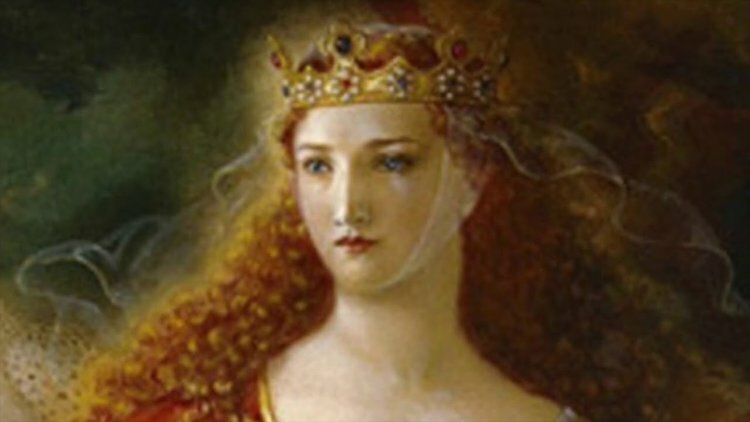 She was Eleanor of Aquitaine – queen consort of France and England, one of the most enigmatic figures in history and one of the wealthiest most powerful women of the Middle Ages. Eleanor or Alienor was the oldest daughter of William X, Duke of Aquitaine and Aenor de Chatellerault, the daughter of Aimery I, Viscount of Chatellerault, and Dangereuse de l’Isle Bouchard, William IX’s longtime mistress. The exact year or place of her birth is not known. She could have been born either 1124, according to a late 13th-century genealogy of her family, or 1136, as some chronicles say. Her birthplace was either Poitiers, Bordeaux or Nieul sur l’Autise where her mother died when Eleanor was a little girl. Eleanor was named after her mother Aenor and was called Aleinor which in Latin means “the other Aenor”. Being raised in one of Europes’ most cultured court, she was given an excellent education. As if he could foresee her future and her turbulent life, Duke of Aquitaine made sure she had learned arithmetic, astronomy, history, but also domestic skills such as household management as well as embroidery, needlepoint, sewing, spinning, and weaving. She was skilled in conversation, dancing, games such as backgammon chess, checkers, she could play the harp and sing. She was well versed in music and literature, riding, hawking, and hunting. Her native tongue was French, well – a dialect called Poitevin, but was also taught to read and speak Latin. By all accounts, she was lively, intelligent and strong-willed. An heir to a man who ruled the largest and richest province of France – Poitou. Eleanor had only one legitimate sibling, a younger sister Aelith also known as Petronilla. Her half brother Joscelin was acknowledged by the Duke as a son but not as his heir. When her father, Duke William X died in 1137, Eleanor (aged 12 or 15) became the Duchess of Aquitaine and the most eligible heiress/brides in Europe. In those days, kidnapping an heiress was considered a legitimate way to obtain a title and knowing that Duke William dictated a will handing over his domains to Eleanor and appointing King Louis VI of France as her guardian. William asked the French king to take care of both the lands and the girl and find her a suitable husband. Until the husband was found, the king had the legal right to her lands. The king, known as Louis the Fat, was also gravely ill at that time but his mind was shrewd as ever. He decided to marry the heir of the most desirable duchy in France to his 17-year old son, Prince Louis and thus bring Aquitaine under the control of the French crown and increase the power and prominence of France’s ruling family – the house of Capet. Eleanor was a member of the Ramnulfids (House of Poitiers) rulers in southwestern France. The marriage was arranged hours after the king learned about the death of one of his most powerful vassals. 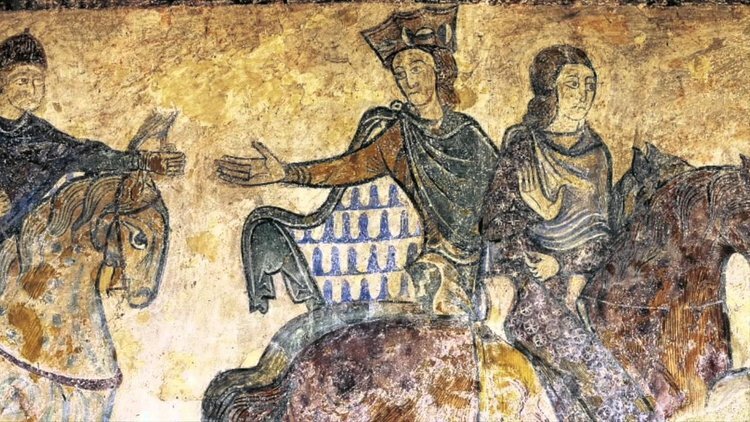 Prince Louis was sent to Bordeaux to collect his bride and the two were married by the archbishop of Bordeaux and then enthroned as Duke and Duchess of Aquitaine. There was a catch – Aquitaine would remain independent of France until Eleanor’s oldest son became both king of France and Duke of Aquitaine. As a wedding present, Eleanor gave Louis a rock crystal vase that is displayed at the Louvre. It is the only object connected with her that still survives. The King of France died days after their wedding and Louis VII and Eleanor were crowned king and queen of France on Christmas Day 1137. Spirited, lively, eloquent, vibratos, temperamental southerner, Eleanor was not popular among the northerners. Louis’s mother, as all mothers in law, though her a bad influence. Tales of her immodest dresses and language were told. Her conduct was criticized by church elders who populated the court. She filled the court with colors, music, and dance, making it more comfortable than before, more to temperamental, southerner liking shocking the cold, reserved Englishmen. An Eleanor loved dressing up in fine clothes, often made of silk and embroidered in gold and silver thread. Her dresses had tight-fitting sleeves to show off her delicate wrists full of bangles and bracelets. She wore a jeweled belt around her waist to show how tiny it was. She dressed up in brightly colored gowns trimmed in fur or gold – and this dressing habit will earn her the nickname “golden foot” when visiting Byzantine court in Constantinople during the Second Crusade. Since she grew up at the wealthy and majestic court of Aquitaine, Eleanor loved luxurious jewelry and had a collection of impressive jewels including massive necklaces and bracelets, rings and earrings and jeweled circlets that held the veils all married women wore at that time. All this must have shocked conservative, plain clothed English courtiers, most of whom were church officials. The king was, however, madly in love with his beautiful bride and granted her every wish, including costly renovation of the cold Cite Palace in Paris to make it more comfortable for her, even though he himself was more than once baffled and vexed by Eleanor’s behavior. Eleanor used her influence over the king to exert her will and marry her sister to Count Raoul of Vermandois and seneschal of France. At the same time, Louis came into conflict with Pope Innocent II when he put forward his chancellor Cadurc and vetoed Pierre de la Chatre for the position of Archbishop of Bourges. Pierre was given refuge by the Theobald II, Count of Champagne who crossed swords with Louis over Eleanor’s plans for Raoul I to repudiate his wife and marry Eleanor’s sister Petronilla. The war lasted two years and ended with the occupation of Champagne. The King was personally involved in the assault and burning of the town of Vitry. The peace was made, Theobald’s provinces were returned and Pierre de la Chatre was installed as archbishop of Bourges, but Louis was still burdened with guilt over Vitry and wanted to make a pilgrimage to the Holy Land to atone his sins. In 1145, Pope Eugene III requested that Louis lead a Crusade to the Middle East. Instead of staying at home as expected, Eleanor insisted on taking part in the Second Crusade to defend Jerusalem against the Muslims. She recruited some of her ladies in waiting and Aquitanian vassals. The legend has it that she and her 300 ladies dressed as Amazons for the trip to Constantinople and then Jerusalem. Benoit de Saint-Maure described in his Le Roman de Troie that Eleanor and her Amazons rode into “battle” on a fine Spanish horse caparisoned with “a hundred tiny golden twinkling bells“ and armed with “a hauberk whiter than snow,” a sword, a lance, and a golden shield bordered with rubies and emeralds. She and her Amazons let “their lovely hair hang free,” an unusual choice since all married women had to wear their hair covered with headdresses, scarves, ornaments, and ribbons that made it look even longer and thus sexier. When in Constantinople, Eleanor was much admired and compared with Penthesilea, the mythological Amazon queen who assisted Troy in the Trojan War because of her love for the Trojan hero Hector and who was subsequently killed by Achilles, Greek greatest hero, although in the Middle Ages he faded into the background making way for more romantic Hector. In the Middle Ages, Penthesilea who falls in love with virtuous knight Hector and later avenges his death and the noble Trojan warrior became romantic heroes and personification of the ideals of chivalry that Eleonor will later introduce and develop in her Court of Love. The Crusade was not a happy adventure for the couple. Louis was a weak military leader and could not maintain discipline and morale among his troops, nor make logical tactical decisions. The already poor relations between him and his headstrong wife deteriorated even further, fueled by the failure of the crusade but also by rumors of Eleanor’s incestuous affair with her uncle, Raymond of Poitiers at Antioch, that stained her already shaky reputation. Upon returning home from the Crusade and the catastrophic assault on Damascus, the royal marriage did not last much longer. Eleanor’s inability to provide a male heir further strained the marriage. The marriage was annulled in 1152 on the grounds of consanguinity—the fact that they were technically related – but not before the Pope tried to reconcile the couple, forcing Eleanor to sleep with Louis in a bed specially prepared by the Pope. They conceived their second child – another daughter, Alix of France. Two months later Eleanor married Henry of Anjou, Duke of Normandy who in 1154 became king of England. The irony is that Eleanor was related to Henry even more closely than she had been to Louis and there were rumors that Eleanor had an affair with Henry’s father Geoffrey V, Count of Anjou, who opposed his son’s marriage with her. When Henry became king of England, Eleanor was crowned queen. Over the next 13 years, the couple had five sons and three daughters. The sons were William, who died at the age of three; Henry; Richard, the Lion-Heart; Geoffrey, Duke of Brittany; and John, surnamed Lackland until, having outlived all his brothers, he inherited, in 1199, the crown of England. The marriage was tumultuous. Henry was by no means faithful to his wife and rumors have it that she wasn’t faithful too, but was much more discreet about it. During those, childbearing years, she was active in the realm and even more so in her own domains. She traveled the kingdom and when Henry was away she helped direct government and church affairs. She turned the court of Poitiers into the “Court of Love” where ideas of troubadours, chivalry and courtly love were encouraged, laying foundations for courtly life and manners that would live on French courts for centuries to come but would also spread to other courts in Europe, although not in such scale. She was the great patron of the two dominant poetic movements of the time – the courtly love tradition conveyed in the romantic songs of troubadours and the historical “legends of Brittany” which originated in Celtic traditions and Geoffrey of Monmouth’s Historia Regum Britannniae. Eleanor also had a huge impact on clothing style in England. She introduced fashions, fabrics, and court etiquette. Women’s clothing, in particular, became richly ornamented and elaborate with emblems and badges embodied into the gowns. She introduced a well known Aquitanian gown known as bilaut into English fashion. A bilaut was a rich gown made of fine silk and worn with a decorate belt and an ornamental girdle. The bodice was split down from underarm to hip and attached with ribbons, enveloping the body even tighter. The skirt was wide and would fall down freely. The sleeves were tight from shoulder to elbows and then flared out, sometimes to the ground where they had to be knotted to be more manageable. Eleanor of Aquitaine also brought new hairstyles and headdresses in England. Barbette was supposedly introduced by her. It was a band of linen encircling the face and pinned into place. It was first worn only by royal ladies but over time it was adopted by all classes. Later in life, after the death of her second husband, Eleanor wore wimple – headdress where long fine linen or silk is draped underneath the chin, across the throat and the ends were pinned at the crown of the head. It is always worn together with a long veil and a circlet. Her cultural activities were abruptly cut when her sons Henry, Richard, and Geoffrey revolted in 1173. It is entirely possible that Eleanor, 11 years her husband’s senior, was fed up with his philandering and have instigated the revolt. In any case, she gave her sons considerable military support. The revolt dialed and she was captured while seeking refuge in France. For the next 16 years, Eleanor was imprisoned in various locations in England. She grew more distant from her sons including Richard who was her favorite, as she did not have the opportunity to see them often, though she was released for special occasions such as Christmas. Despite being powerless and away from the public eye, she was still present and rumors around her never ceased. When King Henry lost his great love, Rosamund Clifford, rumors swirled that Eleanor had poisoned her or that she placed Rosamund in a bathtub and had an old woman cut her wrists. Widowhood sat well with Eleanor. Henry II died in 1189 and Richard I became the heir. While he was off in the Third Crusade, Eleanor influenced the affairs of England considerably as well as the conduct of Princ John who would later become king. 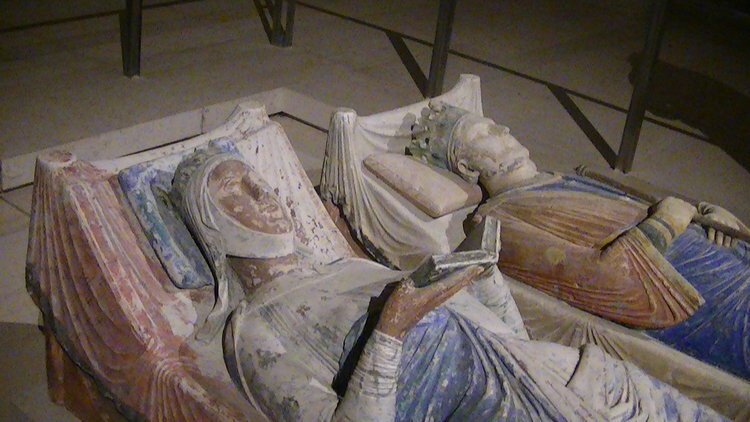 During those years, she tried to ensure the peace between the Plantagenets and the Capetian kings of France by arranging a marriage between her granddaughter Blanche of Castile and the son of the French king. She also helped defend Anjou and Aquitaine and secure John’s French possessions from her grandson Arthur of Brittany. Tired and unwell, Eleanor took the veil as a nun in Fontervraud Abbey in Anjou where she died in 1204 and was entombed next to her husband Henry and son Richard. Despite being known as one of the most beautiful and noblest women of her time, the irony is that nowadays no one really knows how she looked like. Troubadour Bernard de Ventadour said that when she was 30, she was “gracious, lovely and the embodiment of charms” with “lovely eyes and noble countenance”. She was called beautiful even in her old age but no one left a detailed description of her. The color of her hair and eyes are unknown. Was she tall or short, slim or big-bones? We’ll never know. Her bones were scattered when the abbey was sacked later on. The effigy on her tomb shows a tall and large-boned woman with brown skin while her seal shows a woman with a slender figure, although these are probably not an accurate representation. The badass Eleanor was always present in the public eye. Shakespeare wrote her as an aged but sharp and occasionally sultry force in The Life and Death of King John. Katharine Hepburn filled her with her own fiery energy in the movie The Lion in Winter based on the play by James Goldman. She was depicted as a temptress, warrior, protective mama bear, and powerful queen. Beautiful, fiercely intelligent, a woman ahead of her time. Trendsetter. Patron of arts and lover of life. A true queen. Politically savvy and wise, full of energy, beauty, and elegance, she “surpassed almost all the queens of the world,” wrote nuns of Fontervrault .